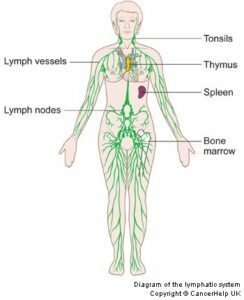 The lymphatic system is often associated with cancer treatment and recovery. This system is responsible for collecting the fluid and proteins that build up in the body tissues and transporting them back into the blood. It also has important roles in immune function and fighting infection. 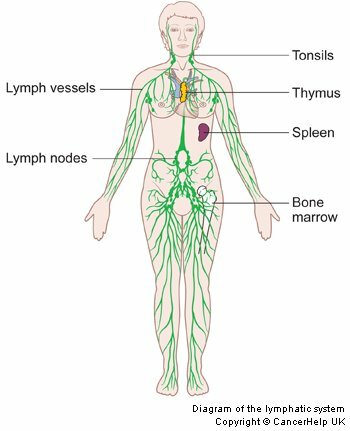 A series of very fine lymph collectors start from just under the skin and carry the fluid through progressively larger and deeper vessels. There is no pump for the lymphatic system, so fluid moves mainly due to pressure changes and muscle contraction. Lymphoedema is most commonly caused when the lymphatic system is damaged due to cancer treatments, this is called secondary lymphoedema. However, some people are born with an inadequate lymphatic system. This is called primary lymphoedema and is much less common. Secondary lymphoedema after cancer surgery often affects one limb, ie. the arm on the side of the breast removed. More commonly lymphoedema develops when a large amount of lymph nodes are removed, but can occur when very few are removed. Swelling can be on both sides of the body if lymph nodes have been removed bilaterally. Early symptoms can include a feeling of heaviness in the affected limb and mild swelling that resolves at night. However, this will often progress into a more pronounced swelling. If left untreated the swelling can increase and thicken (fibrose) considerably and negatively affect quality of life. Once lymphoedema has progressed to the permanent swelling phase it cannot be cured, however it can be managed in order to minimise it’s effects and prevent progression. At Central Lakes Physio we can provide lymphoedema therapy, Vicky has been trained using the Vodder technique through Klose training and is also a Pinc and Steel Cancer Rehabilitation provider.